Akihabara-set sequel due out on November 7 in Japan. 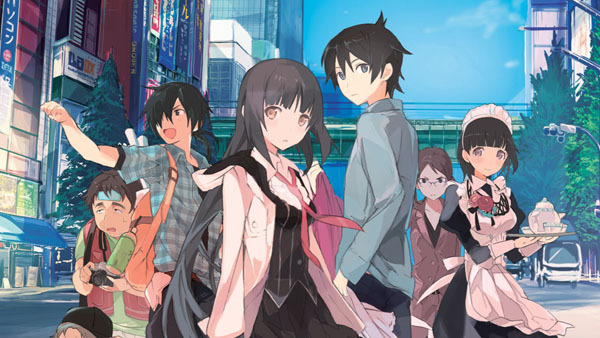 Akiba’s Trip 2 is in development for PlayStation 3 and PS Vita, Acquire announced in the latest issue of Weekly Famitsu. The game will launch in Japan on November 7 for 7,239 yen on PlayStation 3 and 6,549 yen on PS Vita. An Akihabara-set sequel to Acquire’s 2011-released PSP game, its latest depiction of Tokyo’s Electronic Town promises to be a more realistic one. Compared to the previous game, more than two times the amount of real-name stores will appear. The hero will have a partner, and the story will change depending on who your partner is. Kageyashi, the vampire-like beings from the first game, are not the main threat in Akiba’s Trip 2. Instead it is the mysterious organization called Magaimono, who are attacking people in Akihabara. But like the Kageyashi, Magaimono are sensitive to sunlight. Using techniques like “Unison Strip,” you and your partner will cooperate to take your enemy’s clothes off and bask them in sunlight, turning them to dust. Real-name stores set to appear include Edion, Laox, Onoden, Radio Kaikan, Sega GiGO, Lammtarra, Yodobashi Camera, Volks, Akibaoo, and Sofmap. The main character, who’s name is simply “Protagonist,” is an ordinary high school student who was leading a normal otaku life. He is fond of Akihabara. After being caught by a mysterious organization, he is transformed into a Magaimono. Touko Sagisaka (鷺坂登子) – voiced by Chiwa Saito – A childhood friend of the protagonist with a side-ponytail and wears short sportswear leggings. She is not exactly an otaku like as the protagonist, but she is a member of the Akihabara neighborhood watch and knows the area well. Shizuku Tokikaze (刻風雫) – voiced by Sachika Misawa – A purple-haired girl with braided cords. A mysterious power supposedly dwells within her, though what kind of power is unknown. She saves the hero after he is captured by a mysterious organization. Souga Hidzuki (輝月宗牙) – voiced by Ryota Takeuchi – A middle-aged man with a goatee who stands as the enemy. Development is currently 85 percent complete.